Inadvertent peri-operative hypothermia (IPH) is a common but preventable complication associated with poor outcomes for patients, including poor wound healing, increase in blood loss, impaired wound healing, and an increased risk of surgical site infection [1,2]. Crystaline temperature strips (Sharn Anesthesia Inc USA, distributed by Pentland Medical UK) offer a range of benefits in addition to accurate temperature recording. Hypothermia is defined by the National Institute for Health and Care Excellence (NICE) as ‘a patient core temperature of below 36.0°C’ . According to Berger & Fitzpatrick , approximately 70% of patients experience IPH, although Hart et al  suggest this number is 20%. Unfortunately, the combination of cool operating theatres (typically below 23°C (73.4°F) , the fact that the patient cannot physically move elsewhere, and the physiological effects of anaesthesia (altered thermoregulatory mechanisms), can cause core temperature to drop rapidly. Core temperature is that relating to the deep thoracic, abdominal, and central nervous system tissues , and is 2-4°C (3.6-7.2°F) warmer than skin temperature. It is usually measured at the distal oesophagus, pulmonary artery, or nasopharynx. During the intra-operative phase, Nice recommends that the patient’s temperature should be measured and documented before induction of anaesthesia and then every 30 minutes until the end of surgery. Post-operatively, it should be taken and documented on admission to recovery and every 15 minutes thereafter until transfer to the ward. Here, temperature should be measured 4 hourly for 24 hours. Oral, rectal, bladder, axillary, groin, skin, and tympanic membrane measurements are also used to measure near-core temperature (which indicates core temperature). A number of products are used, including infra-red probes and tympanic devices. However, many of these do not allow continuous monitoring, rather the machine has to be activated and a reading taken and recorded at certain times points. Regardless of the interval between measurements, such devices do not allow early warning of change. In addition, these devices carry a cost; tympanic devices for example, use disposable caps for each reading, so the cost of purchasing the machine, calibration and servicing costs, and the on-going cost of accessories need to be taken into account. They are often lost, broken or ‘borrowed’, so replacement costs can be high. All types of measuring devices of this nature can carry cross contamination risk between users. 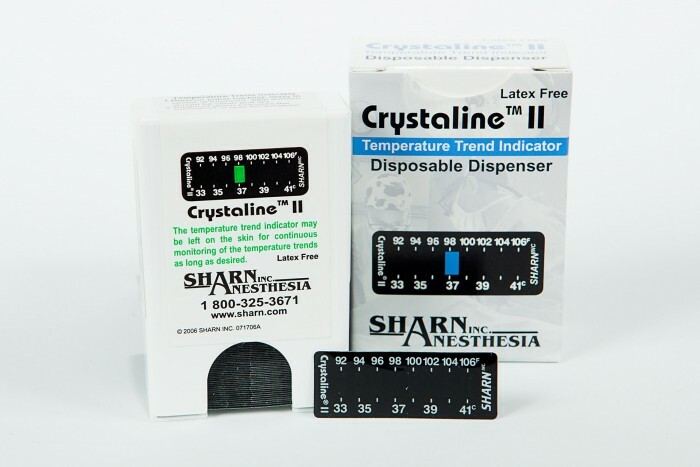 A non-invasive method of continuous temperature monitoring is the use of Crystaline liquid crystal core temperature strips. The strip continuously monitors a mathematically equivalent correspondent of oesophageal core, and is more effective so than rectal or axillary skin alternatives . They will accurately track patient temperature trend relative to oesophageal core; the green line shown on the strip represents the equivalent oesophogeal core temperature (Figure 1). If the strip indicates a change, an oesophageal core measurement should be taken. As well as being accurate, reliable, and low cost, they are ideally suited to facilitate adherence to the Nice guidance on IPH temperature monitoring regimens , making them an extremely viable alternative to other forms of temperature monitoring. The Crystaline temperature strip is placed on the patient from admission to recovery (sometimes 24 hours or longer), so it doesn’t come into contact with anything else, significantly reducing both the contamination risk from other equipment and cross-infection. In contrast, any equipment that must be handled (in order to monitor temperature) or repeatedly applied and removed carries a much greater contamination risk. Over three million Crystaline strips are used annually in the USA alone. While they do not replace the need to use oesophageal core temperature, they do provide the most cost effective, reliable, proven method of continuous temperature monitoring in compliance with Nice guidance. Crystaline provides an alternative to the tympanic and infra-red thermometers that are prone to human and physiological errors. Shouldn’t your organisation consider these in order to comply with Nice guidance?